In my last weekly analysis I expected an immediate decline, under an early assumption that the upwards correction was complete. This view has since been invalidated by the 380-pip rally which set a new high for the month. It’s important to realize that the overall picture is still quite bearish. The entire movement from 1.0340 is clearly overlapping and has an undeniable sideways nature, reaffirming that it’s a counter-trend movement. After a careful re-examination of all the price data we have so far, I’m convinced that this entire correction is less than two weeks away from completion, although not before it makes one more small high. 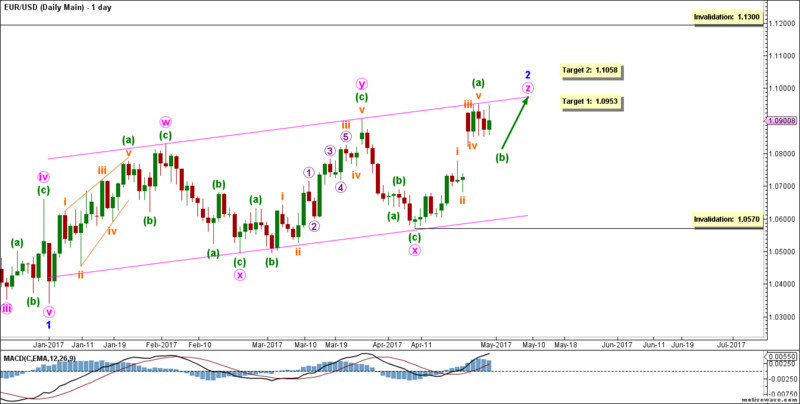 The bigger picture sees that the euro is moving towards the downside in a zigzag labeled black waves (A), (B) and (C). This count sees that blue wave 2 is forming a triple zigzag labeled pink waves w through z. Pink wave z is forming a zigzag labeled green waves (a), (b) and (c). Green wave (a) formed an impulse labeled orange waves i through v. It’s very likely complete. Judging by the very little data available since the presumed end of green wave (a), I strongly suspect green wave (b) is forming some sort of a flat correction. As such, I expect it to make a shallow retracement of green wave (a), possibly reaching no further than 1.0800. 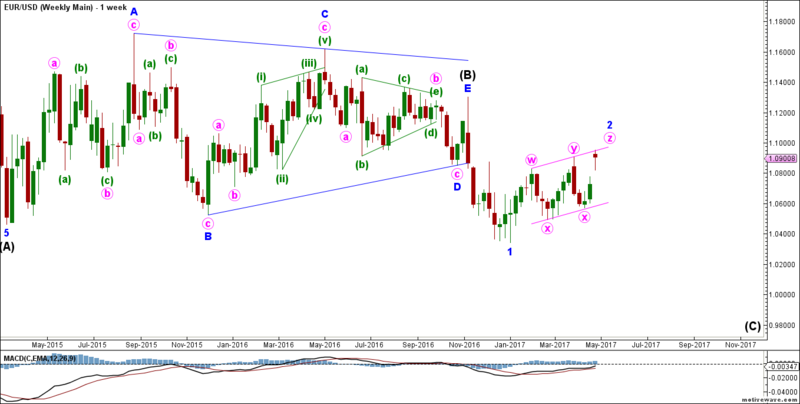 This count expects the euro ultimately to move towards the upside in green wave (c) to complete pink wave z, and therefore blue wave 2. This will be confirmed by movement above 1.0951. At 1.0953 pink wave z would reach 78.6% the length of pink wave w, then at 1.1058 it would reach 100% of its length. This wave count is invalidated by movement above 1.1300 as blue wave 2 may not move beyond the start of blue wave 1.